DIGITAL VERSION of the PDF book MAKING PATTERS FROM EXISTING GARMENTS by Kenneth D. King outlines the method of taking a pattern from an existing garment, without taking that garment apart. Kenneth's method uses buff-colored silk organza as the medium with which to retrieve the information from the garment. 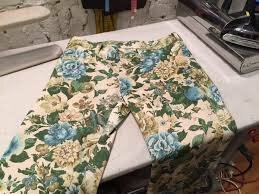 there is a special section on using this method to copy trousers, a section on how to find grain lines when they aren't readily visible, a section on how to fine grain lines on shirts and blouses, and a section on copying puffed sleeves. A separate section shows how to handle pleats in garments. And then a section on pattern making, he shows how to translate this information into a working pattern, complete with facings, interlinings and linings.